The field of view (FOV) determines the area of sky covered by an observation. The term is also used to refer to a product of the skyfov tool, which is provided as part of the Chandra Standard Data Processing pipeline - where it is stored in the primary directory and has the identifier fov1 - but it can also be manually created for an observation. The FOV file created by skyfov contains polygons, one for each "chip" used in the observation, where the polygon outlines the area of the sky observed by the chip (the aspect of the observation is used to project the chip corners and the resulting set of points is then used to determine a polygon). This file can be displayed in ds9 to show the chip edges - e.g. as discussed in the How can I define a region around a chip? FAQ entry. 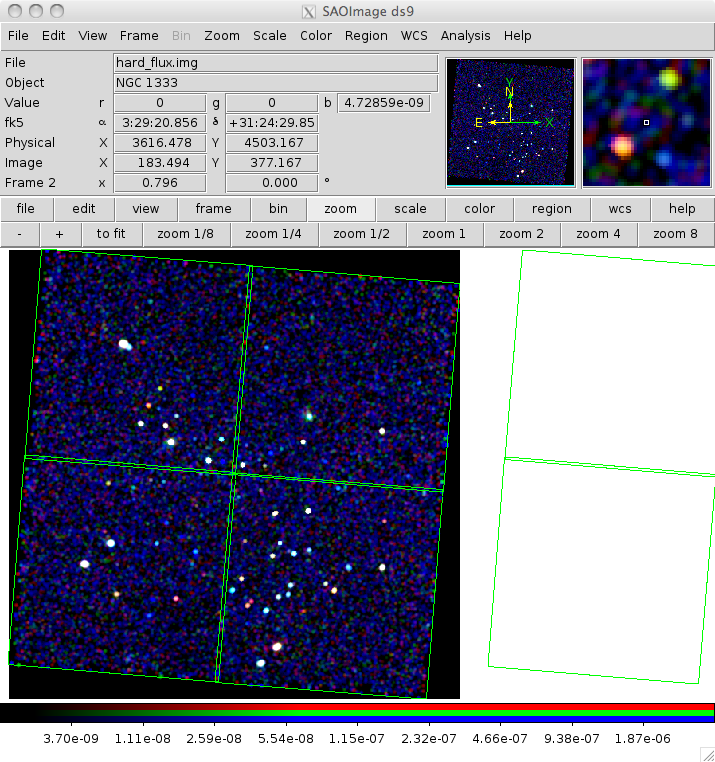 The green outlines show the edges of the six ACIS chips that were turned on for this observation of NGC 1333 (ObsId 6436). The image is a three-color image, created using fluximage, of the ACIS-I array, which is why the outlines for the two S-array chips contain no data.